Note : Prices depends on Size, Marble Quality and Carving Work and Packing prefrence. We offer an exclusive range of Marble Pen Stand with Carving On at unmatched quality and market leading prices. They are manufactured using advance and latest techniques. Marble Pen Holder for Decoration. 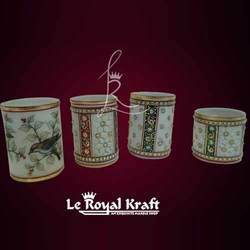 For reasons of quality maintenance, the offered range of Marble Gift Items are known to be made in accordance with the set industry norms and guidelines. Priced at the most reasonable rate possible, its preference in the market is quite high. In addition, the offered range is designed in the most attractive manner possible. We are a leading manufacturer and supplier of Designed Marble Pen Holder. 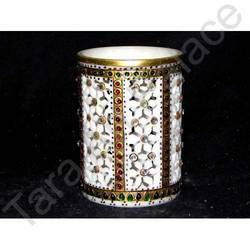 Fine Decorative Marble Pen Holder Available In Different Designs & Sizes. We are the prominent manufacturer and supplier of marble pen stand that are specially designed for holding pen of various sizes. These are widely renowned for high durability, sleek finish and resistant to corrosion or spot. We export these marble pen stands in various countries at competitive market price. Yellow Boy Retail Services Pvt. Ltd. Engaged manufacturing and supplying of the finest quality Marble Pen Stand in the market. Specially designed under the watchful eyes of our creative designers and other experts, handicraft pen holder shine the beauty of table. We can meet the over growing requirements of our clients by manufacturing and supplying a comprehensive range of Marble Pen Holder. Our organization can also facilitate our clients from all over the world by providing them many other products like Full Gold Work Pen Holder as well as Full Fine Gold Work Pen Holder. We offer products at par with the international standards. Dimension: L-1.5 x W-1.5 x H-4 Inches Approx.